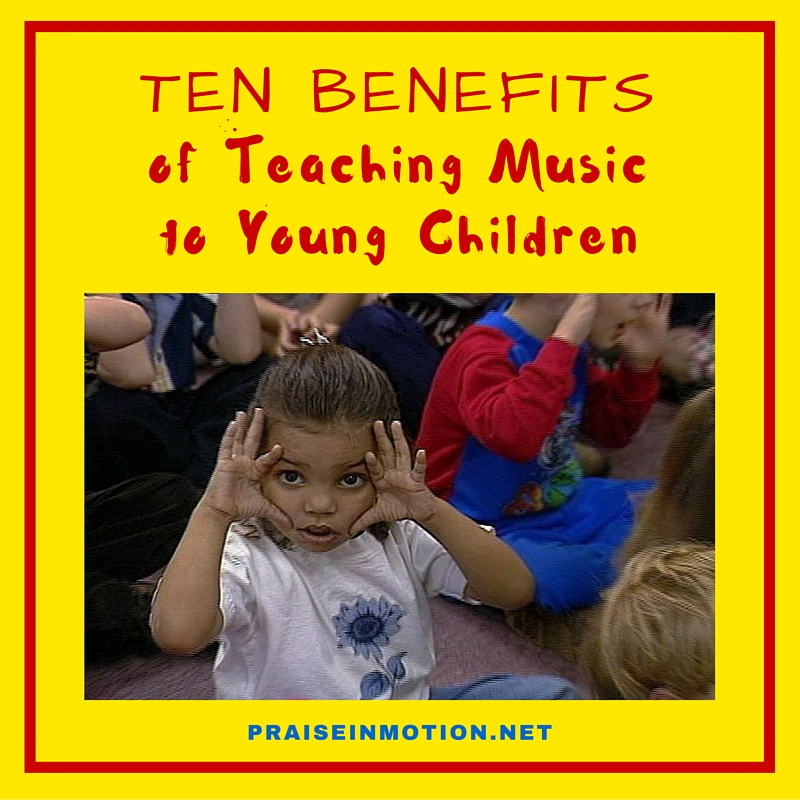 It’s impossible to list or measure all of the benefits of teaching music to young children. Let’s start by saying that music fulfills many needs in all of us. At an early age, children learn that certain songs bring feelings of wellbeing. Music with positive words and a happy sound creates an atmosphere of joy and communicates a message of safety. If a child is in a pre-school, daycare or away from home for any reason, the right music can be a wonderful tool to give them a feeling of peace and a sense of belonging. If there is a regular music session, familiar tunes make children feel “at home”. The routine pattern of a music session is comforting to children. They love to hear songs again and again. Repetition can be a good thing, as children begin to recognize songs and become acclimated to a setting that is new to them. As a young child is learning self-discipline about the wrong ways to use their arms, legs, hands and feet, it’s so important for them to have the ability to use their body in positive ways. On a playground, they may be allowed to run free in contrast to the classroom, where they must normally sit or have structured behavior in relatively controlled activities. A music session is a perfect opportunity for young children to learn certain disciplines, while also having the freedom to move about, if motions and movement are involved. Children are quite capable of quickly adapting to participating in coordinated actions along with the other children in their class or music session. During a music session, there are many opportunities to recognize the children for their participation. Some children join in more readily than others according to how much exposure they have had to music in their life. Those who may show signs of awkwardness at first will almost always be drawn in through happy tunes and with the right encouragement. Children are constantly learning. Becoming able to sing a new song is a big accomplishment for a child. Children love to be told they are “growing” or getting better at doing things. A good music teacher will introduce songs with words and motions that are age appropriate, but will also monitor the children’s progress and ability to move forward and learn new music that may require more concentration and dexterity, if movement is included. As children make progress, it is wonderful to congratulate them on their increasing ability to do more complex songs and ones that may require extra coordination. Bible story songs can provide a wonderful way to teach children an early appreciation for the Word of God. As children learn these songs they begin to understand more about the love of God and how His power can help them to grow and be strong. Some songs may not necessarily involve a Bible story, but might help to lay the foundation for good morals through a message that can be applied to certain behavior and consequences. Even though there are many different musical styles in the world today, parents may often be selective in their personal preferences. A deliberate effort to introduce children to a variety of tempos and instrumentation can be very healthy for their development. Helping children learn an appreciation of many types of songs not only keeps a music session interesting, but can also be stimulating for the brain. Some children seem to naturally sense or “feel” the beat in music. Others, not only aren’t conscious of it, but may also have additional balance and coordination challenges. Through rhythmic motions, clapping, marching and even singing—many children eventually become comfortable keeping a beat to the music. Actions that may have seemed clumsy at first, can become more graceful with practice and encouragement. Songs that welcome children to shake hands with each other, squeeze each other’s knees, scratch each other’s backs, form a circle by holding hands—offer positive ways to have physical contact. A song that gives a child an opportunity to have eye contact with the person next to them can create a way for both children to sing words declaring that they are each special. This can stimulate an early development of the act of kindness and promote positive behavior from one individual toward another. Some days in the home or classroom will be challenging for a parent, caregiver or teacher. For one reason or another, a child or a whole classroom of children may be experiencing personal or corporate chaos. Rainy days can often produce attitudes and behavior that require extra creativity. Happy sounding music can be a real lifesaver at a time like this. The right choice of songs can lighten tension and shift the focus of a negative situation and literally create a more positive atmosphere. One of the hardest things for young children is “waiting”. Music can be helpful as a means of passing time as they wait to have their turn—or wait to do something they are impatient about. Songs can be sung as a group while children are on their way from the classroom to another location as a way to keep everyone focused. Singing fun songs can be a great distraction whether in the potty line or on a car ride. Christina Cook Lee is a veteran music teacher who has produced an extensive amount of music with motions for young children, as well as video workshops for teachers and performance tracks for music programs. All of the products are available on the website at http://praiseinmotion.net. Next post: Why use back-up tracks for music classes?